If you’re thinking about borrowing, now’s a good time to assess your financial situation. To find out whether you’re ready to take on new debt, you can measure your credit status against the criteria that lenders use when they review your application. 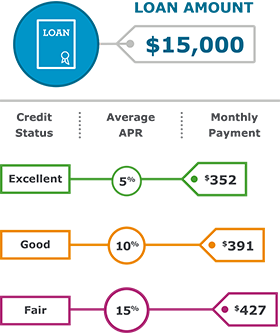 When you apply for a new credit account, lenders evaluate your application based on key factors commonly known as the 5 Cs of Credit. Your credit history is a record of how you’ve managed your credit over time. It includes credit accounts you’ve opened or closed, as well as your repayment history over the past 7-10 years. This information is provided by your lenders, as well as collection and government agencies, to then be scored and reported. A good credit score shows that you’ve responsibly managed your debts and consistently made on-time payments every month. Your credit score matters because it may impact your interest rate, term, and credit limit. The higher your credit score, the more you may be able to borrow and the lower the interest rate you could receive. For example, with a good or excellent credit score, you might qualify for a lower interest rate and monthly payment on a loan of $15,000. The example below explains how your credit rating could impact your annual percentage rate (APR) and monthly payment. Rates show are for illustrative purposes only. You can request your credit report at no cost once a year from the top 3 credit reporting agencies ― Equifax®, Experian®, and TransUnion®. When you get your report, review it carefully to make sure your credit history is accurate and free from errors. Note: This free annual credit report doesn’t include your credit score. Each reporting agency charges a fee to see the credit score they’ve given you. Did you know? Wells Fargo offers eligible customers free access to their FICO® Credit Score ― plus tools, tips, and much more. Learn how to access your FICO Credit Score. Your credit score reflects how well you’ve managed your credit. The 3-digit score, sometimes referred to as a FICO Score, typically ranges from 300-850. Each of the 3 credit reporting agencies use different scoring systems, so the score you receive from each agency may differ. To understand how scores can vary, see how to understand credit scores. You generally qualify for the best rates, depending on debt-to-income (DTI) ratio and collateral value. You typically qualify for credit, depending on DTI and collateral value, but may not get the best rates. You may have more difficulty obtaining credit, and will likely pay higher rates for it. You may have difficulty obtaining unsecured credit. You may not have built up enough credit to calculate a score, or your credit has been inactive for some time. Capacity indicates how comfortably and consistently you’ll be able to make payments on a new credit account. Lenders use different factors to determine your ability to repay, including your monthly income and financial obligations like loan payments, rent, and other bills. This calculation is your debt-to-income (DTI) ratio, which is the percentage of your monthly income that goes toward expenses like rent, and loan or credit card payments. Lenders look at your debt-to-income (DTI) ratio when they’re evaluating your credit application to assess whether you’re able to take on new debt. A low DTI ratio is a good indicator that you have enough income to meet your monthly obligations, take care of additional or unexpected expenses, and make the additional payment each month on the new credit account. Learn how DTI is calculated, see the our standards for DTI ratio, and find out how you can improve your DTI. Collateral is a personal asset you own such as a car, a savings account, or a home. Collateral is important to lenders because it offsets the risk they take when they offer you credit. Using your assets as collateral gives you more borrowing options—including credit accounts that may have lower interest rates and better terms. If you have assets like equity in your home, or a savings or CD account, you could potentially use them as collateral to secure a loan ― and you may be able to take advantage of a higher credit limit, better terms, and a lower rate. But, remember, when you use an asset as collateral, the lender may have the right to repossess it if the loan is not paid back. A credit card, loan, or line of credit secured by your savings, is one way to start building your credit history ― or rebuilding it if you’ve had problems in the past. Learn more about establishing credit or the different types of secured loans and lines of credit we offer. Lenders evaluate the capital you have when you apply for large credit accounts like a mortgage, home equity, or personal loan account. Capital represents the assets you could use to repay a loan if you lost your job or experienced a financial setback. Capital is typically your savings, investments, or retirement accounts, but it can also include the amount of the down payment you make when you purchase a home. Capital matters because the more of it you have, the more financially secure you are ― and the more confident the lender can be about extending you credit. How you plan to use the proceeds from the loan or credit account. How your loan amount, interest rate, and term may be impacted by market conditions or the state of the economy. Other factors that could impact your ability to repay the debt ― for example, a mortgage lender wants to know if the property you’re buying is in a flood zone or in an area prone to wildfires. Conditions matter because they may impact your financial situation and ability to repay the loan. Lenders may also consider your customer history when you apply for new credit. Since they may evaluate your overall financial responsibility, the relationship you’ve established with them can be valuable when you need more credit. Explore resources to help you improve your credit and manage your debt.